AO Safety Junior Ear Muffs are black and were the first ear muffs from Peltor to be produced for children. Through our experience with thousands of parents who have bought ear muffs for their babies and children, we have learned that these top quality ear muffs are an excellent solution for protecting your baby's and young children's hearing in all sorts of venues: NASCAR, concerts, and all manner of loud situations. NOTE: The package now says "For Ages 13 and Up." Over more than a decade we have been selling these ear muffs to parents who have uniformly told us they work perfectly well for their children as young as 3 weeks (though we generally recommend using them for babies no younger than 3 months of age.) The ear muffs have not changed, but we wanted you to know before you buy them for your child and then see the label recommendation. With a padded headband and foam-filled ear cushions, this low-profile ear muff is ultra light weight and ideal for babies up to small adults. Other than color and markings on the ear muffs, these are identical to Peltor Kid ear muffs. Peltor/AO Safety Junior Ear Muffs (NRR 22)5K. CarneyApril 7, 2015Another satisfied customer and her child. Bought these for my almost-two year old son so he could be in the shop with us when we're using power tools. Once he realized what they were for, he wanted to put them on himself. And he kept them on! I think that is the best review there could be: the child is clearly more comfortable with them on than off. Thanks for a great product (and great service)! Peltor/AO Safety Junior Ear Muffs (NRR 22)5DonnaNovember 5, 2012I bought these for my Autistic son. He loves to wear them. Thanks. Peltor/AO Safety Junior Ear Muffs (NRR 22)5linda celedoniaJuly 24, 2012GREAT! ANOTHER PAIR THAT I BOUGHT FOR MY SECOND GRANDSON. THE FIRST PAIR I BOUGHT DIDN'T COME WITHE THE STORAGE BAG. BAG IS AWESOME! BOTH GRANDSONS ALWAYS LOOK FOR THE EAR MUFFS WHEN THEY ARE OUT AND IT IS NOISY. Peltor/AO Safety Junior Ear Muffs (NRR 22)5Freda ChismMarch 6, 2012I bought these for my 17 month old grandson Wyatt to wear to the race track. I ordered them early thinking it would take a little bit to get used to. When I received them I put them on him expecting him to take them off. He looked at me and smiled then went off about playing with his toys still wearing his ear muffs. I think he likes them! Peltor/AO Safety Junior Ear Muffs (NRR 22)5KellyFebruary 29, 2012They look large, but they fit great and I can tell they are going to fit her for many years. They also must be comfortable, because my daughter left them on for hours without pulling them off. Peltor/AO Safety Junior Ear Muffs (NRR 22)5MichelleJanuary 30, 2012My 5 year old and 3 year old grandsons love these ear muffs. Fit perfect. Will be used around lots of heavy duty construction equipment noise. What sold me was MADE IN USA!!! Fast delivery. Peltor/AO Safety Junior Ear Muffs (NRR 22)5CrystalJanuary 11, 2012Love the ear muffs! They fit both my 4 yr old and my 15 month old with plenty of room to grow! The best part is they were MADE IN AMERICA which I think is so Important! I chose these over other brands just for that reason! Buy American made! Peltor/AO Safety Junior Ear Muffs (NRR 22)5Leon AndersonJanuary 5, 2012My 22 month old son sat main floor center at a Trans Siberian Orchestra concert, and didnt flinch a bit. Enjoyed it immensely and didnt mind the headphones. Peltor/AO Safety Junior Ear Muffs (NRR 22)5MauraAugust 28, 2011these are great!!! Peltor/AO Safety Junior Ear Muffs (NRR 22)5MikeAugust 7, 2011These are great. My daughter hated having them on but once she fell asleep it was smooth sailing. She slept through a VERY loud concert! Peltor/AO Safety Junior Ear Muffs (NRR 22)5ELVIAAugust 5, 2011MY SON IS AUTISTIC AND HE LOVES THEM... TRIED IT OUT IN LAS VEGAS AND AT THE BEACH...A MUST HAVE ITEM!!! Peltor/AO Safety Junior Ear Muffs (NRR 22)5Susan SchumacherJune 22, 2011The Ear Muffs are our perfect solution. We have had them a couple of weeks and finally got to use them last night during some bad storms. Our son ended up sleeping with them on all night. I tried to remove them while he was sleeping and he woke up and insisted on keeping them on. The storms returned today and he found them and is playing happily without a care about the thunder. We'll get to try them out at a baseball game this weekend, but they are definately a major hit so far! Peltor/AO Safety Junior Ear Muffs (NRR 22)5ChrisMay 2, 2011The first 5 times or so my 16 month old son wanted nothing to do with them, then the 8 second dragsters roared down the quarter mile drag strip. He realized if he keeps them on it wasn't so loud. These muffs worked so well that my wife and I were pushing our son in his stroller thru the pit area and he fell asleep. We walked back towards the starting line and was 20 ft from the burnout box and he was STILL ASLEEP! UNREAL! We even had another mother of 2 children aproach us and ask where we found these ear muffs. She liked how they were a snug fit, and a low profile design. She wasn't pleased with the ones she had bought for her children. She said they were too bulky. In my book, this product should be in the same safety category as a childs car seat. GREAT PRODUCT! Peltor/AO Safety Junior Ear Muffs (NRR 22)3Cristy WeemsApril 28, 2011Purchased these for our infant son (he weighs about 9kg) who attends every Nashville Predators NHL game with us. These are a little to big for him, wish I had purchased the brand recommended by this site for infants but the bright colors are obnoxious. We picked these because they were black. He hates them so we are having to put them on a few minutes everyday to get him used to them. We will continue to use the silicone plugs that our audiologist recommended until he gets used to them. Also, I thought the wire slides on the side are a little flimsy. Peltor/AO Safety Junior Ear Muffs (NRR 22)5KarenApril 26, 2011We bought three for grandkids ages 3,4, and 5. They wore them for four hours at drag racing event to watch grandpa race. Perfect!!! Peltor/AO Safety Junior Ear Muffs (NRR 22)5ValarieMarch 11, 2011Wonderful product!! They were bought for my 7 week old son to attend live WWE event with our family. They worked so well he slept halfway thru the show!!! The camera crew were taking shots of our son because he looked so darn cute in the ear muffs! Would HIGHLY recommend these! Peltor/AO Safety Junior Ear Muffs (NRR 22)5alp2974March 3, 2011I purchased these ear muffs for my 3 1/2 month old son for Mardi Gras 2011. They fit him great! He didn't mind them one bit and people kept commenting on how cute he looked. Peltor/AO Safety Junior Ear Muffs (NRR 22)5ColleenFebruary 14, 2011I just purchased a third pair of these ear muffs for my daughter who has auditory sensory issues --- one pair for school, one for home and this last pair to keep in my mini-van for unexpected noisy events. She recently wore them with ear plugs to my nephew's wrestling tournament where there were tons of whistles, buzzers and cheering/clappoing, and did great. She also wears them to bed if it is a windy or stormy night. They work great. Peltor/AO Safety Junior Ear Muffs (NRR 22)5MeredithFebruary 8, 2011We bought these for our two-year-old son for a monster truck show. They were great! They fit perfectly and he actually kept them on! I was worried they would be too big for him, but I was wrong. I would recommend these to anyone looking for ear muffs for a loud event. 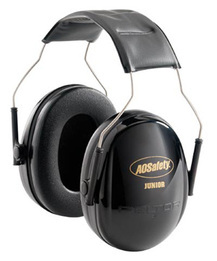 Peltor/AO Safety Junior Ear Muffs (NRR 22)5CherayJanuary 17, 2011Great product for a great price. These work great for my son, who has sensory issues, when he's at sporting events. Peltor/AO Safety Junior Ear Muffs (NRR 22)5parentJanuary 5, 2011Great item! My child used them for the first time on the plane. I wish I had known about the product years ago. Makes a good gift for a birthday. I recommended this item to the passenger in front of me whose little one was uncomfortable with the noise from the plane's engine.